That’s Independents!! a celebration of NYC presses and their writers! I’m excited to represent great weather for MEDIA alongside the incredible writer, Corrina Bain. Three Rooms Press presents a celebration of the New York independent literary tradition with THAT’S INDEPENDENTS: A Celebration of NYC-based Independent Presses. Doors open 5:45 pm, showtime is 6 pm. Admission is $8, which includes a free drink. Each of the five publishing companies represented will discuss their publishing ethos—and what sets them apart—then present work by some of their current authors. 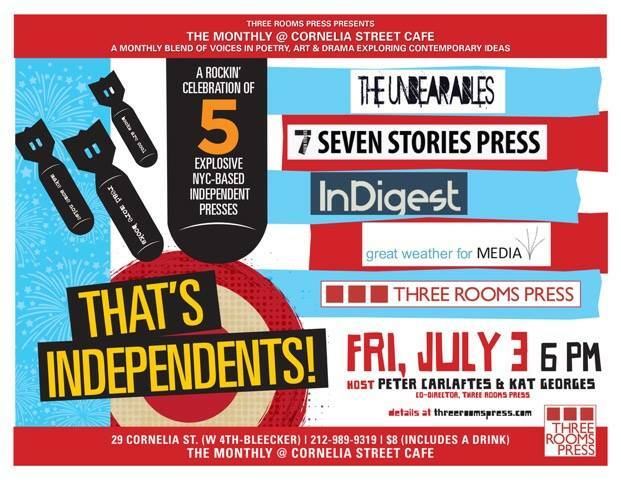 Presses include: The Unbearables, InDigest, Seven Stories, Great Weather for Media, and Three Rooms Press. Doors open at 5:45. Admission is $8, which includes a free drink. Cornelia Street Cafe is at 29 Cornelia Street, in the West Village, between W. 4th Street at Bleecker (http://corneliastreecafe.com/). Aimee Herman performs the piece “a meeting of selves through the salve of love” and an excerpt from “Postulation” in the Nerve Lantern poets’ theater show: An Afternoon of Sparking Poetry. Additional performers: the phenomenal poet, artist, music making Trae Durica. Hosted by Medicine Show Theatre as part of its Word/Play series of writers’ readings. New York City. July 19, 2014. Co-organized by Kris Lew and Ellen Redbird. Nerve Lantern: Axon of Performance Literature is a literary journal published by Pyriform Press and edited by Ellen Redbird. This program at Medicine Show Theatre was made possible in part by a grant from the New York State Council on the Arts, a State Agency. 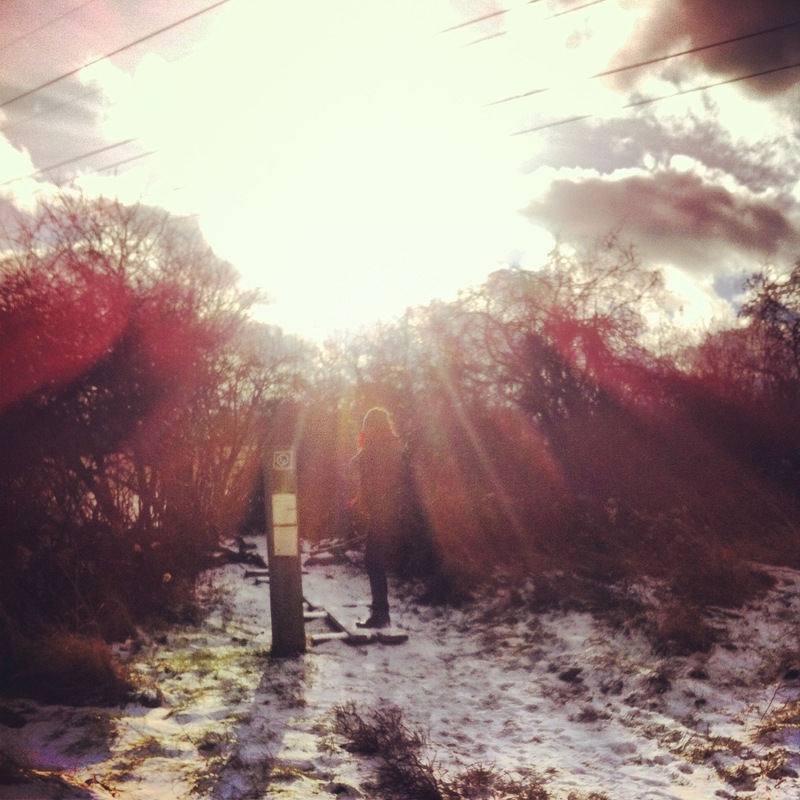 day 6: poems out loud. Here are two poems I read at Parkside Lounge at an evening celebrating the great poet, John Sinclair. Several years ago, a poet said to me: Write the poem that will get you in trouble. So, I immediately thought about the first time. Freshman year of high school. I was still practicing Sylvia Plath’s name on my tongue. I was falling in love with Bob Dylan and Lou Reed and I had enough sadness to melt the sun into a puddle of tears. I read a poem of mine in front of a room full of strangers during a school assembly. Teachers who did not know me started worrying for my life. The guidance counselor called me in. Everyone worried about me and my safety. Do you want to hurt yourself? Do you have a plan? I had no idea the power of words until that moment. I didn’t exactly get in trouble, but I did get noticed. There was that time I thought I hated men, so I wrote a poem that would taint my breath for years. It was one of the first poems I ever read at an open mic. Strangers called me angry. The one I wrote about the only boy I ever loved. It didn’t get me in trouble, but those words haunted my palms for years. I’ve written poems that have outed my sexuality, my identity, various jobs I’ve accrued that I’ve left off resumes. I was never looking to get into trouble. Instead, I just wanted to feel heard. Like that first time at the assembly when finally people started to see me. Words clarify the blurriness of our existence. I smuggle poems all the time: in my pocket, against my hips, stuck to my cracked heels. I’ve swallowed so many that I have a permanent ache in my gut. I’m not looking to harass anyone’s eyes or brains. I’m only looking to cause a commotion with your one-way thoughts. I want to twist your mind into questioning what you think has only one answer to. OK, maybe I am looking into getting in just a little bit of trouble. I’m looking forward to cracking open some words and seeing what exists inside the guts…. Join me in the community room on the third floor of the Suffern Village Hall. Located at 61 Washington Avenue in Suffern, NY. Doors and sign-ups will open at 7:30 PM; poetry will start at 8:00 PM. Poems, amazing people, fun, and delicious food and drink. And books for sale! $5 recommended at the door. “Epilogue on Broken Benches” is one of my favorite poems by Puma Perl, found in her chapbook, Belinda and Friends. I was deeply honored to read a few poems last week to celebrate Puma Perl’s new collection of poetry, Retrograde, put out by Great Weather for MEDIA. Purchase a copy of Retrograde now! 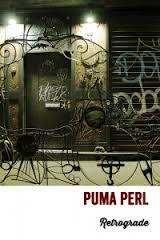 I first saw Puma Perl perform in a tea lounge on the lower east side. I was mesmerized by the poetics in her authentic new york accent, the illustration of her skin in tattoo form, the rebel in her words. 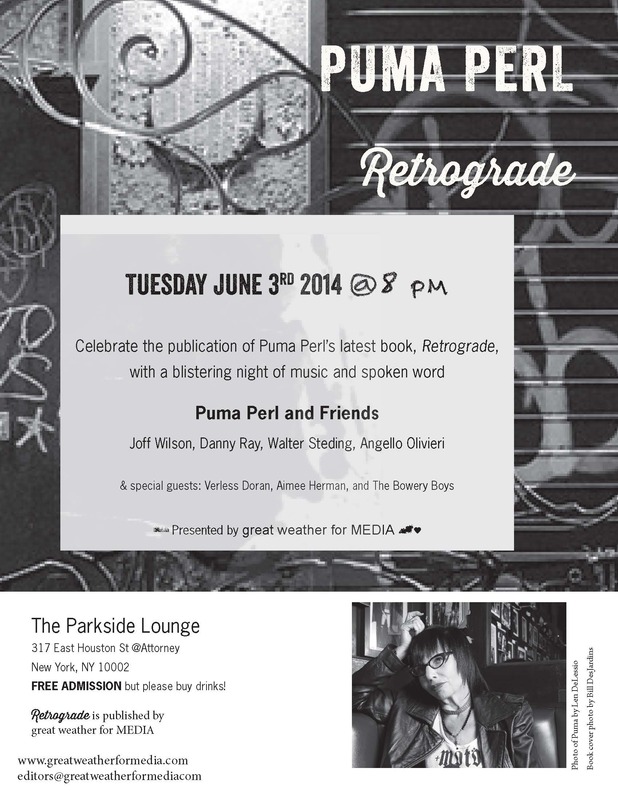 Tonight, she celebrates her brand new book, Retrograde, put out by the great NYC press, great weather for MEDIA. I’m deeply excited to be reading a few poems tonight to celebrate this new collection as well, also joined by Joff Wilson, Danny Ray, Walter Steding, Ollivieri, Verless Doran, and The Bowery Boys. Tonight: A Performance of Many Poets! Poetry Teachers NYC is excited to celebrate an evening of poetry, movement and mixed media performances tonight. Teachers: Todd Anderson, Thomas Fucaloro, Caitlin Gill, Dan Dissinger, Aimee Herman, and Megan DiBello and their students get to present their pieces created from various workshops. This will be one of the most unique performances you will ever go to! With a mix of code poetics one minute, to collaborative poetics, to movement through the space. There is nothing like it! We are honored to have our featured Poet, Actor, Singer, MC, Producer, All around GREAT person always, Shawn Randall.